There are a few things in life you tend to wonder if you have the ability to achieve. One of them, from my point of view, has been the rehabilitation of the Vetus M2.05 engine nestled in Jacob Jones. When I bought the boat, it had sat on a trailer for several seasons. And bad things happen to a diesel that is neglected like that. It's been a long term goal to get it rebuilt (or at least checked out) to determine whether or not it really needed to be replaced. It's history (and unreliable nature) while I have owned the boat has been just one instance of disappointment after another. The engine was pulled out of the boat in the fall of 2011 and thru 2012 the boat spent it's summer weekends tanning gently in the sun of Worton's Creek Marina's upper yard. I gradually took it all apart, checked it all out, replaced various "might as well since I'm in here" parts and reassembled it under the professorial tutelage of a good friend. untangling of snarled subsystems with a careful logical processing of the implications regarding the data the systems show you as you proceed. If-then-else is only a start of a very nasty decision tree that emerges as a system is petted, analyzed, brow-beaten and persuaded into reliable and predictable behavior. 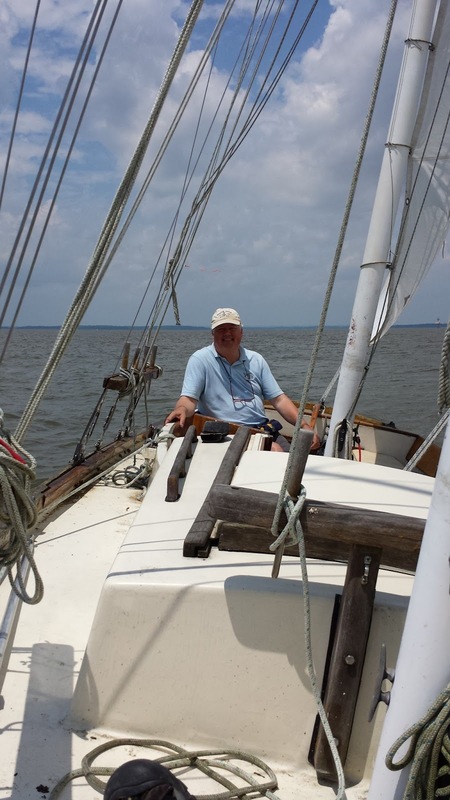 And yes, in the final summary, the systems of a sailboat's diesel are very simple. And at this point, I'm probably in rare company indeed of those who know the K2AS engine this well. Because, at this point, she runs better than ever before. Her unloaded RPMs spin right up to manufacturer max, and with her current gearbox and prop, she's able to push 4.2 knots at 2000 rpm. That's a huge win. I think we can get more out of her as we tune it. Additionally, the damn thing starts like it's no big deal. Lights up right away. Now all that is left is to make my confidence in it a thing that only time and continued experience with it running just fine can create. The motor, after 17 months, is back in the schooner. 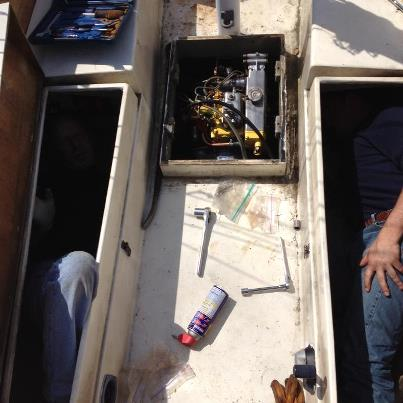 Huge thanks to the friends who helped install, plumb and wire the little Vetus back into her! We had delightful hot weather yesterday, and the motor install went better than expected. We ended up having the wiring near the starter solenoid to be NQR and so had to head home for glimpses at the pix we didn't think we would need because we didn't think we'd get quite so far in the reinstall process. With a few minor wiring puzzles to think over, I suspect we're less than 3 hours from "splashability". We also pumped out about 5 gallons of old diesel fuel. Not sure how much is left in the tank, but we'll be sure to freshen it all up and add some cetane booster to make sure the whole thing gets what it needs from the fuel. Lighting her up is next. did a quick trip to varnish a few rails. she looked good in her mothballed state. Not knowing a lot about diesel behavior, the whole notion of pulling Mr Vetus out of the boat, hauling it up the road, diagnosing it and deciding on a course of action, was almost overwhelming. Schooner Jacob Jones, being a small schooner 31 feet overall (and quite a sizable portion of that is bowsprit), has a very small Vetus diesel engine. It's a mid-to-late 1980's Vetus, an M2.05, which is a very rare engine indeed. It would be impossible to fix or maintain over the longer haul if it didn't share a key characteristic with a much more popular engine of some repute. You see, a Vetus M2.05 is based on a Mitsubishi core, a K2AS, which was also used, thankfully for this exercise, within the Westerbeke 10 Two. Yep, the parts I generally needed were common to the 10-Two. The K2AS is a interesting engine. It was quite the feat of small, light diesel engineering - this SAE paper describes the engine's basics. It was apparently used in a variety of generators, marine diesels, and a few small tractors. So that's pretty cool. But then Vetus managed to embed this OEM core inside of one of the initial range offerings that gradually ended up producing the entire series of smaller Vetus diesels, all of which are wildly more popular than this little M2.05. The M2.06 for instance, which I would give my eye teeth to replace the M2.05 with, has many more instances. (or a lust, lust, Beta for that matter). In the late summer of 2011, trying to get ready for a long trip, I had her out and doing "speed trials" (which is a misnomer for the eventual 4.2 knots we got from her at WOT). But she was throwing a lot of soot out the tailpipe. The engine was laboring, overloaded and all the easy diagnosing pointed to Mr Vetus being beyond repair. The fuel, the oil, the air intake, the compression (which was low-ish in number 1 and really low in number 2), the fuel injectors, and a few other items all checked out. The head remained. Were the valves all crudded up or was the problem even more evil, something wrong with the governor or god-knows-what? In the fall of 2011, I had managed to get the boat ready to move across the Bay from Worton's to Baltimore to try to reach the start of the Great Chesapeake Bay Schooner Race. The morning of the attempt, we had trouble getting her into gear, she'd die. We started her in gear, she'd die. Just nothing. Disappointment. We tried to perform extraordinary measures. Nothing. Giving up on the attempt, we still went over to the GCBSR in Baltimore's Inner Harbor, and got to take a ride on the Norfolk Rebel. It was both cold and windy, but at least it was raining! Very nice modern yachting session. Some of the big schooners were literally "romping" and it was a sight to see. A few weeks later - we pulled the motor out of the hull. The Professor just kept undoing bolts until Mr Vetus came loose. Loaded her on a trailer using the Marina's "stabbing crane" and brought her home. As we took it all apart, it became quite clear the problem was with the valves in the cylinder head. Soot, corrosion and pits! We separated the head from the block took it down to a speed shop here in Wilmington (Accurate Machine of Newport) where Jim took one looks and said - "there's your problem". The second cylinder's exhaust valve was not doing it's job nearly well enough. At this point, it's suspected that when the boat sat over several years on a trailer, the second cylinder's exhaust valve was open to the world, rust, moisture, and badness settled in like pneumonia in an old man. When we began running the motor 5 or 6 years back, lots of trouble. And no end of it, just gradually getting worse.